Looking to find a job that is in a specific geographic area? Perhaps you are moving somewhere new, or you are looking for a job close to home. Finding a job in your area takes an array of strategies, including utilizing job search sites that focus on local jobs, researching local community boards, visiting career fairs in your city, and checking out your local alumni association or their website. By using multiple strategies, you are more likely to find a job that is right for you and is in the region you want to be in. Read on for more detailed tips on where to look to find jobs at companies in your area. The best way to find jobs in your town or city is to use multiple strategies at once. Read below for a list of techniques to use to find a job in your area. While you might not use all of these strategies, pick the ones that are right for you. Check out Job Search Engines: While job search engines will list jobs available nearly everywhere, you can do a search for jobs just in your local area. Try using your favorite online job search engine or job board's "Advanced Search" function to specify the zip code and/or mile radius you're willing to consider. You can try a large job search engine like Indeed, or check out a niche job site that fits your specific industry. 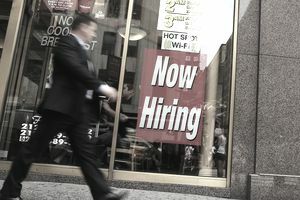 Visit Local Job Search Sites: There are websites that specifically target the local job market. Sites like Craigslist, Geebo, and Jobing, focus on jobs listed for specific geographic locations. Check them out to find listings that may not be posted on national job boards. Check out Company Websites: If you know what company you want to work for, check out the company website to see if they have any job listings in your area. Bigger companies tend to allow users to search for openings by geographic location. You can also check out job boards that focus on specific companies. For example, LinkUp searches for jobs that are posted on company websites. Use the Advanced Search Option to find jobs by company, or find jobs within a particular location. Try Community Boards: If Nextdoor.com isn't available yet in your neighborhood, it's likely coming soon. The site has many neighborhoods online, allowing this virtual community board of neighbors to communicate with others in their vicinity. While its primary goal is sharing useful information like “Can you recommend a good locksmith?” you'll also find local residents looking for employees for their businesses. Check State Resources: Most states have their own job banks, phone and web directories, and other resources specifically for local job seekers. At an even more local level, you can check out your local Chamber of Commerce website, which typically posts local job listings. Visit Career Fairs: Check out career fairs in your local area. Job fairs are a great way to do one-stop career shopping at a single event. Typically, the companies at a fair are based near the job fair location, so you are guaranteed to find local jobs. Join an Alumni Association: Reconnect with your university's alumni association through their website. These groups can provide significant employment resources, classes, and workshops as well as positions posted by local employers. Alumni associations don't just keep graduates connected to their school; they are also a great source for networking and professional development and may host local events if you're in a large urban area. You might also check out your university's career services office. Most of them are willing to help students find jobs even after graduation. Network: Networking is a terrific way to find almost any job. Talk to connections (including friends, family, and professional contacts) you have at companies of interest. In particular, talk to contacts in your area who might know about other openings near you.